This 12-story building at 1 Lexington Avenue is the handsomest pre-war apartment building overlooking Gramercy Park. It was erected in 1910 and has 27 cooperative apartments, many of them duplexes. The impressive brown-brick building has a high cast-iron fence around it and the canopied entrance leads to a four-step-up, colonnaded portico with Tuscan columns. The Gramercy Proposed Historic District Extension noted that above the portico are round-arched windows embellished with finely carved garlands of fruit. The building has several impressive decorative balconies and a cornice and a three-story stone base. It is pet friendly. The building, which is also known as 123-125 East 21st Street and 49-50 Gramercy Park North, has a doorman and an elevator person, windowed kitchens and wood-burning fireplaces. It is convenient to the many restaurants in the Flatiron and Union Square districts and there is convenient good public transportation. 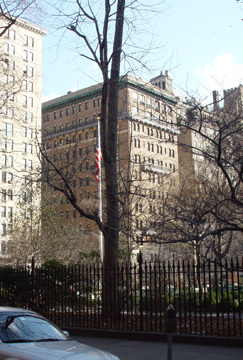 It was designed by Herbert Lucas who also designed the 24 Gramercy Park South. According to Andrew Alpern in his book “Luxury Apartment Houses of Manhattan,” the building was erected by a company headed by Edward Corning and the design of 1 Lexington Avenue is refined and restrained with a two-story stone base and upper floors of deep red brick laid in Flemish bond. He noted that voluted stone keystones are displayed over each window, as well as cast-iron balconies on stone console brackets, and a colonnaded and balustraded stone porch. The building originally had only 12 units. Residents have included Uma Thurman and Winona Ryder, the actresses, and Danny Meyer, the restaurateur.